Convert MTS to MOV and other 1000+ video formats easily and quickly on Windows/Mac. Edit MTS videos with trimming, cropping, rotating, adding watermark, etc. Compress MTS video size easily without losing any quality. Transfer converted MTS files to iPhone/iPad/Android devices for easy playback. MOV is a file extension used by the QuickTime-wrapped files, created by Apple Computer to work with multimedia files, while MTS is a file extension for the high definition digital video camera recorder format. And MTS is only popular with saving cam videos and rarely can be found in other places and also is out of format supported lists of many popular devices and apps. Which means, if you want to enjoy your MTS camera videos with Apple software or devices, you'd better convert MTS to QuickTime MOV or other compatible formats instead. In this article you'll find the step-by-step tutorial focuses on MTS to QuickTime MOV conversion. What you need is an easy-to-use MTS to MOV Converter - Wondershare UniConverter (originally Wondershare Video Converter Ultimate). It supports both Windows and Mac system and helps you finish the task within three steps keeping the video quality at the same time. Read the following parts to know more details. 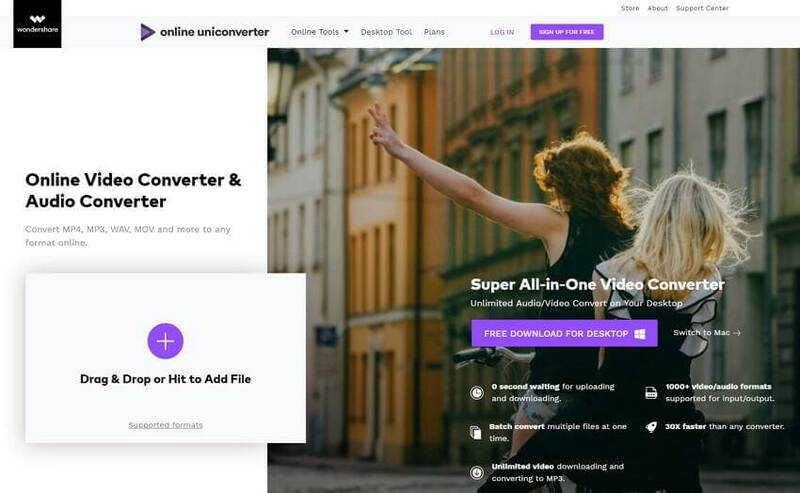 Wondershare UniConverter is an all-in-one video converter which allows you convert, edit, compress videos in 1000+ formats. You can add MTS/M2TS/AVCHD files from your camcorder to your PC/Mac directly via a USB cable. 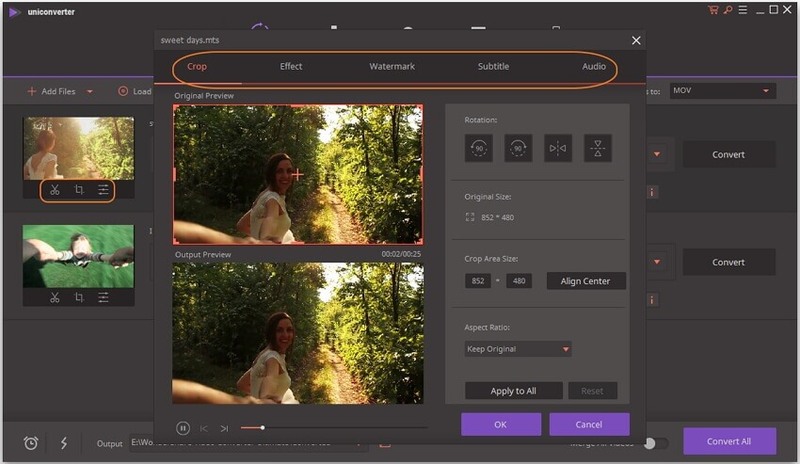 Video editing features like trimming, cropping, rotating, adding watermarks, applying effects and more others can also be done here. You can also compress MTS file size smaller to save space for your devices. Follow the easy steps below. 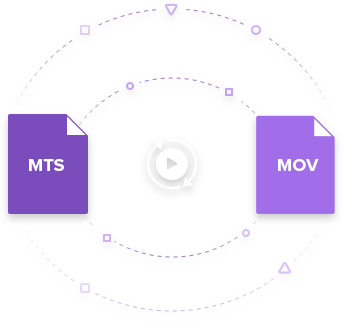 Convert MTS videos to MOV and other 1,000+ formats, like AVI, MKV, MOV, MP4, etc. Compress MTS file size easily without losing any quality. Edit, enhance & personalize your MTS videos with trimming, cropping, adding watermarks, etc. Burn MTS videos to playable DVD with attractive free DVD template. Download or record videos from 10,000+ video sharing sites by pasting URL. Before you convert MTS to MOV with Wondershare UniConverter, you need to free download and install it firstly. The steps below are based on Windows version, if you're Mac users, you can also follow similar steps or read How to Convert MTS to MOV on Mac >> to learn more details. Step 1 Add MTS videos to MTS to MOV converter. You can click the Add Files button on the main interface to load MTS videos you want to convert, or just drag and drop these files to this app's file list for video conversion. Step 2 Edit MTS video file (Optional). 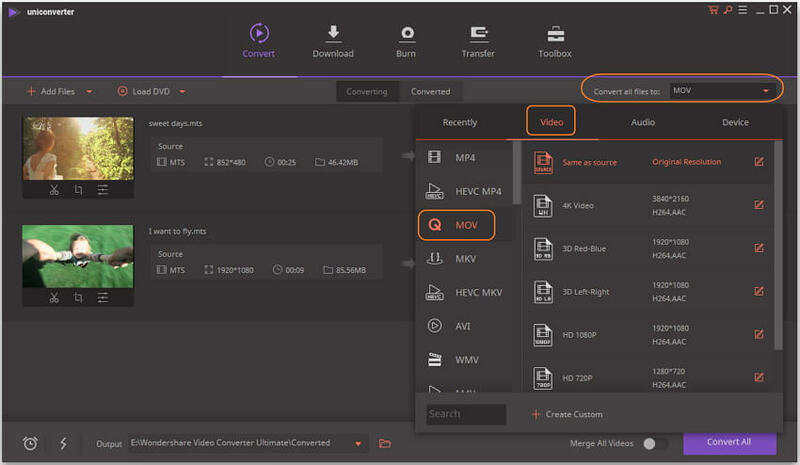 This MTS to MOV converter also provides editing functions. If you want to make your video more optimized or personalized, you can click one of the Editing icons under the video thumbnail to clip, crop, adjust, add subtitles, apply effects to your own taste. Step 3 Set MOV format as the output format. Click the inverted triangle beside Convert all files to to enter the Output Format pane, then you can choose MOV in the Video category. And you can also click the Edit button to do some extra settings, such as the encoder, resolution, frame rate, bit rate, etc. Click the Convert All button to convert MTS to QuickTime MOV. After the conversion process finished, you can click the Converted tab to find out where you saved the converted files. Import MTS to Final Cut Pro : The step-by-step guide will show you how to import MTS to Final Cut Pro for further editing. For those people who don't want to download or install any software on their computer, online video converters are always the optional choices. 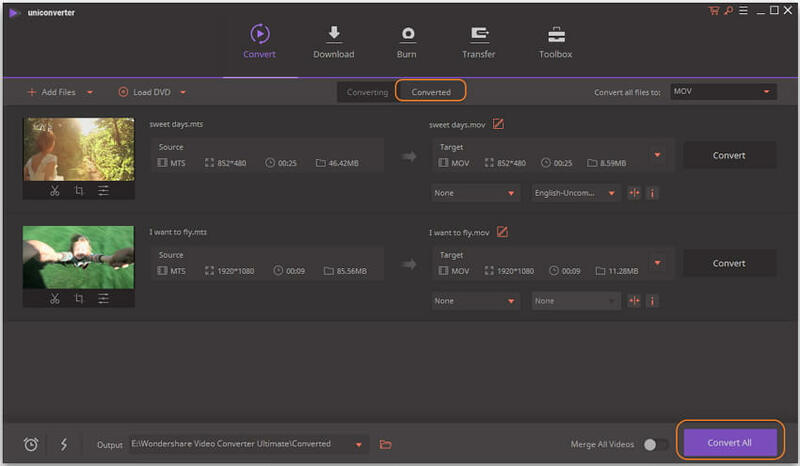 Online UniConverter (Originally Media.io) is such a tool to convert MTS to MOV online and free. It supports most common video formats for conversion online, you can also make basic editings with it. Just finish your online MTS to MOV conversion within 3 simple steps. 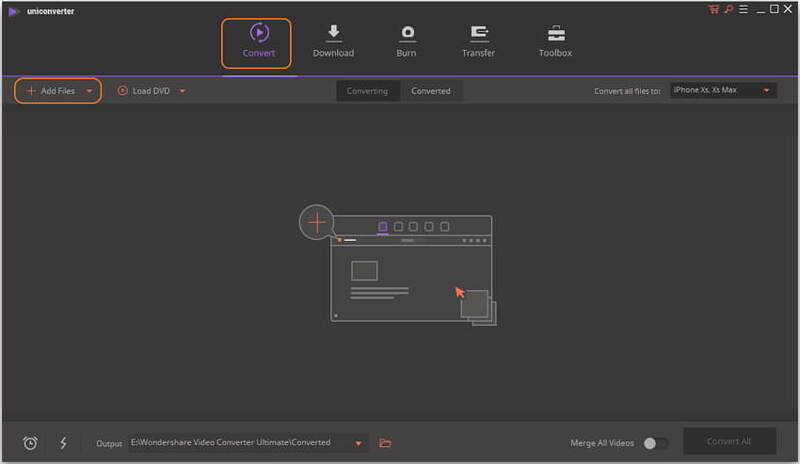 Step 1: Open Online UniConverter (https://www.media.io/) from your browser, and click on the Drag & Drop or Hit to Add File button to add your MTS files. Step 2: Choose MOV from the Video tab, which you can open from the Convert all files to: option. Step 3: Click on the CONVERT button to start converting MTS to MOV free online. Tips: To learn more online MTS to MOV converters, you can move to Top 5 Free Online MTS to MOV Converters to learn more. As online tools always have file size limitations, you'd better choose Wondershare UniConverter if you have many large MTS files for conversion. Free download and follow the steps in Part 1 to convert MTS files to MOV easily and quickly.